Hooray, hooray, a brand NEW Reading with your kids Certified Great Read is here! We’re super happy to announce that Peek-a-Bunny by Kristin McCabe has been named a RWYK Certified Great Read. We are really excited about this announcement, as you may recall Kristin was a guest on the show on Sunday, March 4. We would like to republish that interview here in celebration of Peek-a-Bunny joining our list of Certified great Reads. Congratulations to Kristin McCabe for winning RWYK Certified Great Read Status for Peek-a-Bunny! 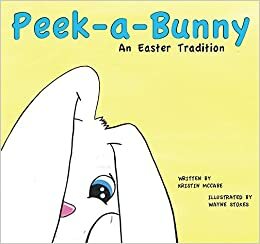 Start a new Easter Tradition this year with this whimsical book and baby bunny that will play Peek-a-Bunny with your family in the weeks leading up to Easter. Peek-a-Bunny is a family friendly, interactive book that lets you play with the little Baby Bunnies! The baby bunnies will be at your house to play. But they must go to bed where they wake up each day. Peek-a-Bunny with your new Bunny friend in the weeks leading up to Easter! Kristin McCabe was born and raised in Wrentham, Massachusetts. She holds a Master’s Degree in Elementary Education from Bridgewater State University and an Undergraduate Degree in English from the University of New Hampshire. In 2009, Kristin married her high-school sweetheart Mike McCabe and they have since settled down in Plainville, Massachusetts with their two children Mackenzie and Cameron.Kristin loves spending time with both her immediate and extended family and loves family traditions even more. Creating this book and starting a new family tradition was the perfect way to make Easter that much more special for her and her family! Are you looking for a book to read with your kids this Easter that is highly entertaining, great for early readers and is jam packed with colorful pictures, a plush bunny doll and more? Peek-a-Bunny written by Kristin McCabe has it all! Peek-a-Bunny is a beautifully illustrated Easter story for families that lets kids play with little Baby Bunnies and make new bunny friend! The book kicks off with who else? The Easter Bunny of course and he introduces us to his mini helpers, baby bunnies. They have a very simple yet entertaining job to do. Playing Peek-a-Bunny with kids every day. From the beginning of March to Easter Eve to spread Easter cheer and to remind them of Easter coming. The illustrations really add to the story and kids will enjoy the instructions at the end for naming their own baby bunny on a certificate which they can print and cherish all the Easter memories. Young children will be delighted to find these adorable bunnies on each page and listening to what they say. Scenes include three cute bunnies hiding the Easter eggs, playing peek-a-Boo with children by hiding themselves in a cookie jar, snuggling up under a blanket and playing around in the laundry rack. We had a great time reading Peek-a-Bunny and think is an excellent read for beginning and early readers. We highly recommend this book for a quick bedtime story and to be read aloud with friends and family. It would be a good fit for anyone around the Easter time however can be read anytime of the year for a fun bedtime read. We think this book would be more suitable for kindergarten because of its very simple text and large print, as well as its cartoon-style illustrations. The anticipation of what’s hiding on the next page and the bright, engaging illustrations will keep curious children guessing and giggling all the way to the ending. Children will be delighted to receive a plush bunny doll with a copy of this book as it is sold as a package. Bunny doll will make for a great gift and will certainly add up to kid’s excitement level. This book also has a lot of good points to help open up conversations about Easter traditions with your child. Overall we’re happy to have found this book and thankful to Kristin McCabe for sharing her little gem of a book with us! Again a big thank you to Kristin for providing us a free copy of this book through Reading with your Kids certified program. The opinions expressed in this review are entirely our own. In case you missed it, be sure to check out Kristin’s appearance on the reading With Your Kids podcast. PreviouslyIs Your Child An Emotional Eater? Join us to Find Out!